I know we are concentrating on protein this term but I felt the need to share this story on sugar, which you may hear or have heard at bootcamp today. A PT client of mine, who is happy for me to share his story, came to me about 8 weeks ago wanting to get fitter and lose a bit of body fat. I counselled him on nutrition and he was smashing his workouts to the point of vomitting (he was putting everything into it). He reassured me his nutrition was going well and he had cut down on all the bad stuff. Eight weeks down the track he says he’s worried he’s not meeting his fat loss goals. “maybe we need to look at changing something with your nutrition” I said. Then out with it he came. “I haven’t been honest about my sugar intake” he said. He then informed me he was still having 3 sugars in his coffee (1 coffee a day) and drinking about a litre of made up cordial when he got home from work. CORDIAL!!!! One of the first things I tell people to quit when they start with me. Wasted calories!!!! I wasn’t happy. I added up the amount of sugar he had consumed since he started 8 weeks prior. Wait for it-3 kilograms of sugar in 8 weeks, and that was just in what he was drinking!!! It was hindering his proggress. Let me share with you an email I recieved from some PT authors (Sharny and Julius) to explain the “nasty” behind sugar and why it was hindering his fat loss. 20 years ago, the enemy was fat. Fat makes you fat, right? Nowadays, there is a whole barrage of fat supporters, claiming that the real reason we’re fatter than we should be is sugar. Eating sugar triggers the release of a hormone called insulin, the most amazing hoarder you’ve ever met. Imagine a slightly creepy relative, one that is overly obsessive about cleaning; except for the fact that they don’t have a rubbish bin, they just clean everything constantly, but put the dirt and rubbish into the cupboards. This is insulin. Now imagine giving that hoarding weirdo a line of cocaine, laced with speed and mixed into a litre of coffee, topped with an energy drink. Their behaviour is similar to what insulin is like, when fed sugar. It packs everything (and I mean everything) into the lovely little storage spaces in your body we know as fat cells. On top of this, insulin is a real sugar junkie. If it gets a sniff or a taste, it just wants more. You feel this as hunger. Even though you just ate half your body weight in sweets; 10 minutes later, you’re ready to go again, and feeling a little sick (because you’re dehydrated). Oh, that’s right, insulin doesn’t just pack the food into the cells, it lines it with water. Sooo, cutting out sugar will reduce your insulin response. The sugar picketers are saying that if you are overweight, it may because of the sugar in your diet, not the fat. Because we are constantly barraging our bodies with sugar, (and a lot of the time not even knowing it) our little hoarder friend is hypersensitive to sugar, and is like the junkie who is fed more and more of the delightful cocktail of yuck that I described to you earlier. Hoard, hoard, hoard; before you know it you’re the size of a dump truck and your heart is being crushed in your chest; all the while that hoarding little sh*t is screaming at you “I want more!” like the movie Oliver, except this week, you’re gonna slap that kid in the face and kick him in the balls. Next week will be a really, really interesting week. You’ll discover how much sugar you actually eat (every cereal except for oats is high in added sugar). Some of you will discover the depth of your (until now) unknown addiction, while some of you will discover a willpower you never thought you had. If you feel you are not meeting your fat-loss goals, take a look at your sugar consumption. It could be holding you back from making progress. Now back to protein. I tried this new recipe yesterday and loved it! You can have it for breakfast, a snack (good one to take to work in a plastic container)or use it as a dessert. It is packed with protein and will keep those hunger pains away! You need to soak your chia seeds in the coconut milk overnight. Use a ratio of 1 part seeds to 2 parts milk. I did half a cup seeds to 1 cup of milk which is enough for 3 servings. 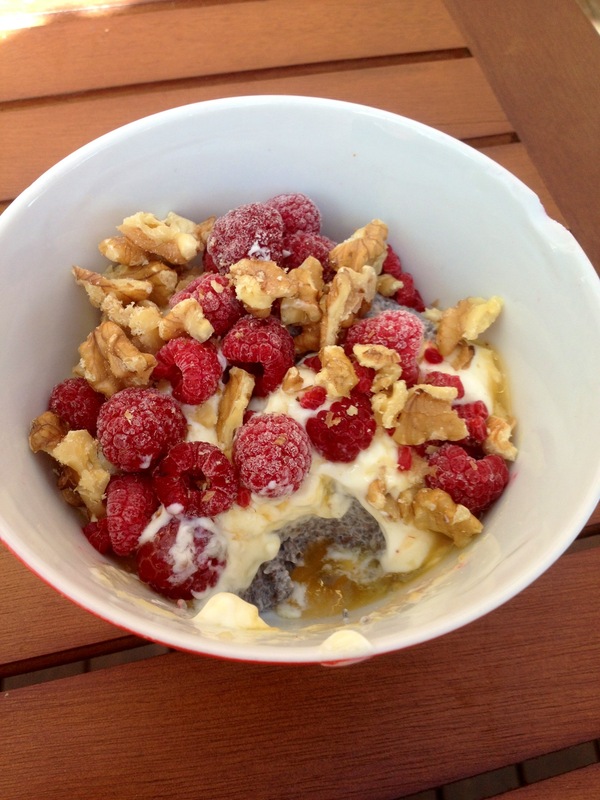 Place a couple of spoonfuls of the chia and milk mixture in the bottom of a bowl, follow with a dollop or 2 of yoghurt, some raspberries and finish with the crushed walnuts. I must admit I was a bit apprehensive about how this would turnout but the texture in your mouth is to die for! Its great to hear you are giving all these recipes a try, Nic. You’re seeing great results because of the changes you have made with your nutrition! 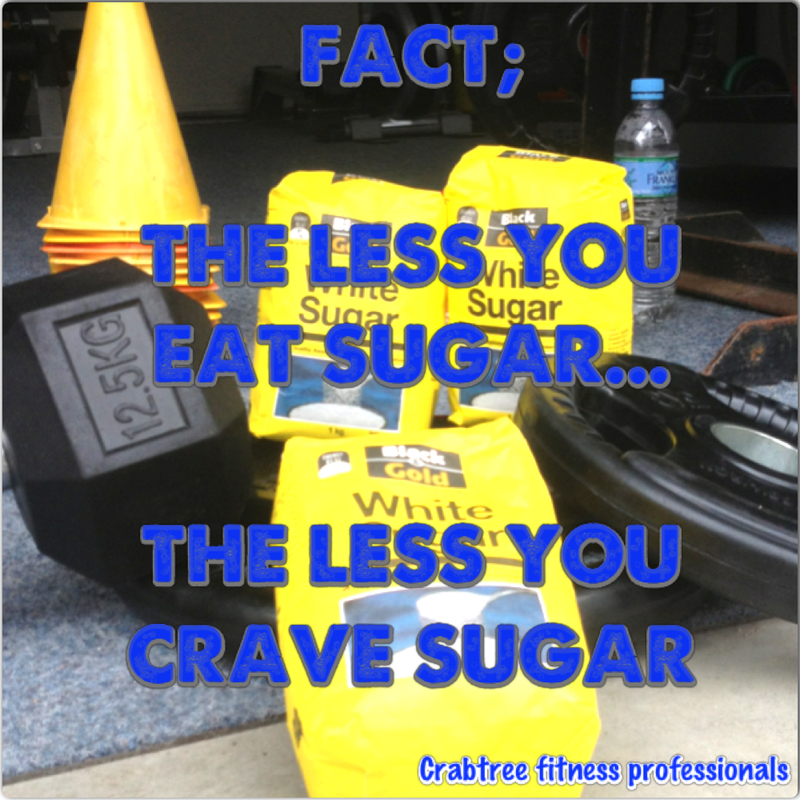 “The less you eat sugar, the less you crave sugar.” – I’m happy to know this fact. Now all I need is to consume less sugar to get used to it. Good thing I’m not into sweets! But hey I tried your recipe and it’s so damn good! I like to put a lot of chia seeds on it. Thank you.